Groups requiring guided tours by Garden guides must contact Loretta Floors on 028 272 9311 or email Loretta at least two weeks ahead of time to make a booking. We will do our best to tailor-make a tour depending on the groups’ interests if we are given adequate notice. The fee structure for groups will be made known on request. Tours are usually a minimum of an hour and maybe longer depending on available time and group interest. Unfortunately guided tours over weekends and public holidays cannot be accommodated. Various information pamphlets and brochures concerning the local area are available. They will give you ideas about what else to do in the area and what accommodation and eating places are available. 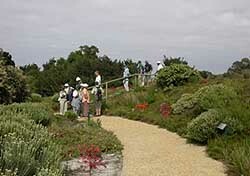 All individuals or groups entering the Garden pay normal entrance fees. Some groups arrange for payment in advance of the tour. Other groups pay on arrival, but the method of payment will depend on which tour company has organised the tour.